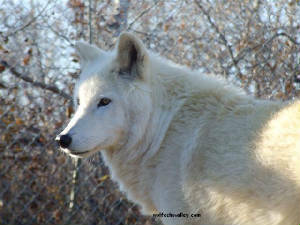 Dharma is a stunning white wolf born in the spring 2004. You can view a sibling of hers at the Calgary Zoo In Alberta...Dharma is a serious and intense young female and teaches me how truly sensitive these creatures are to everything. She is a teacher in her own right. She always wants to be the leader and have everyone follow. 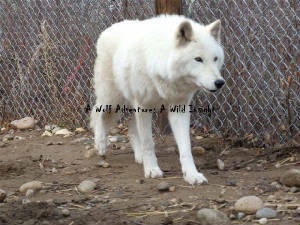 Little does she know the ways she gets outsmarted ;0) Dhama personifies and enforces ALL the reasons why no wolf makes a pet! and scroll down to the section on seasonal aggression. 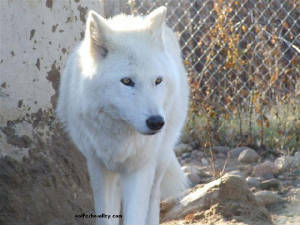 If caretakers of wolves are not VERY experienced, such as ourselves at AWA, they could wind up in some serious altercation and possible injury/harm to the caretaker. For more info on this please go here www.wildsentry.org and click on essays and links. 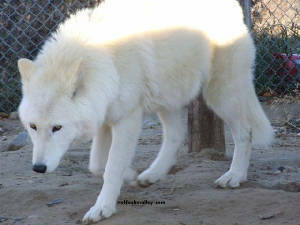 Dharma is a perfect example of how variant personalities can be from one wolf to the next. As easy going as legend is, Dharma takes the world VERY seriously. 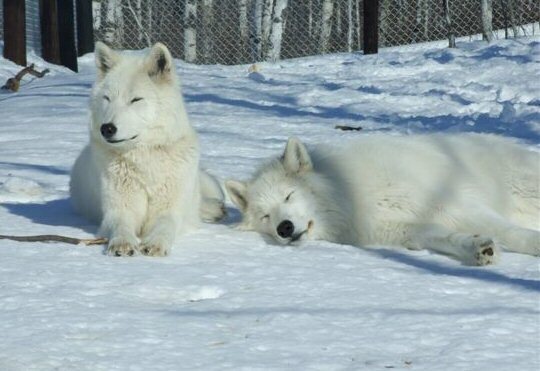 Just like people, wolves can get moody, but wolves can be highly reactive, or even overreact at times, depending on the situation and the surrounding circumstances. 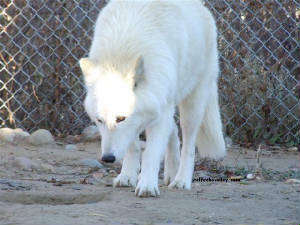 In the wrong inexperienced hands, all of what makes a wolf a wolf, can be potentially dangerous. It must be pointed out that though dharma is what I consider *tame* to a certain degree (some other experts may agree or argue this point) she still retains inherent wild tendencies, regardless of being raised in a captive situation. 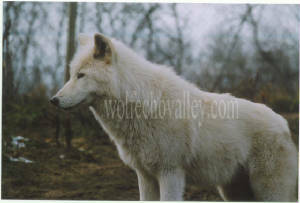 Wolves are NOT domesticated, no matter how many generations of them have been raised in captivity,/domestic situations. I have heard the term *domestic* wolves, but IF this term is used, this should not be a referral, and taken to mean *domesticated*. 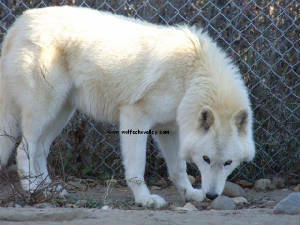 There are some lines of wolves that can inherit and pass on more tractable traits, like Legend and Tibet (these types of wolves are great working in film etc) but even they do not become *dogs* nor can you make them into one . 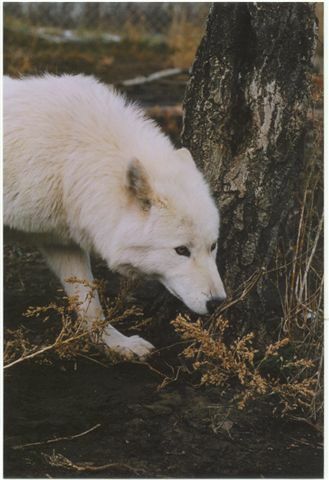 Though wolves do not display any known behaviors not also found in the typical domestic dog, what varies is the frequency, and intensity of the behaviors and in which context those behaviors may be expressed. Dharma's space, needs and wants are respected at all times. Why argue with a wolf? 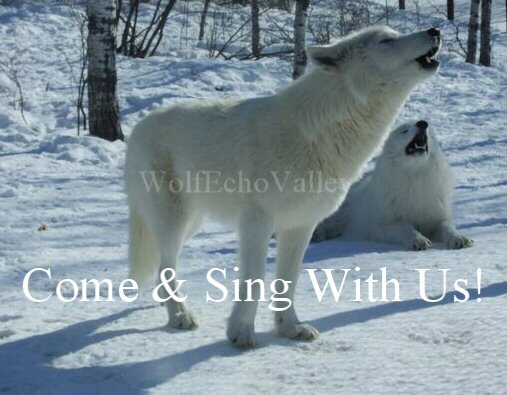 Through many years of studying and analyzing wolf behavior (ethology), wolf language becomes easily read. They certainly are far from unpredictable. Any training done with the wolves at AWA is done because it gives them something to do, and it can help give the people working with the wolf somewhat of an upper hand when it comes to having to take them to the vet, get a lead on them, or prepare them for getting any blood work done, training helps to give *any canine* guidance even wolves, to a point. Contrary to popular belief wolves can be trained to a certain degree, wolves like to work and use their minds, and training helps them to accomplish this. If one works with the wolf and is attentive to the wolfs needs and desires it is not as hard as some may think to get the wolf to do what you want them to do. Though training can help shape even alter the nature of wolves through nurturing, nature certainly plays a big part in what a wolf is truly all about, and in the end this must be taken into consideration if one wishes to be dealing with such creatures in their daily lives. 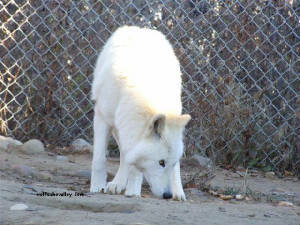 Wolves are magnificent to watch and dharma is no exception when it comes to what a wolf is. One cannot push themselves onto a wolf, it is disrespectful of the wolfs own personal space, just as people need it so do wolves. When we are feeling icky do we want people to grab us out of the blue regardless of our feelings? Wolves are tolerant to a degree but as with all animals including the human animal wolves have their snapping points too. They will come to you on their time and will display affection when they see fit to do so. They do not live their lives to please humans the way dogs do. 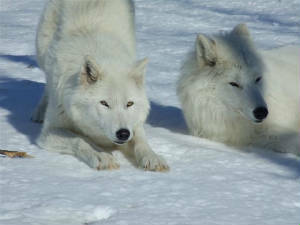 Wolves are independent animals and this independence makes them survivors. 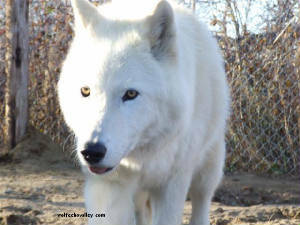 Their teeth, their brain size, their legs, their chests, their nails, feet, tail, ears, coat are all designed to aid the wolf in surviving in the wild. In the classrooms I have taught the kids differences between our domestic bunny rabbits we have as pets and the wild jack rabbits. Jacks Rabbits (Hares) are *designed* with more exaggerated features their feet size and leg size for hopping faster and farther distances in one leap, their ear size for hearing predators better, the same thing can be said about wolves, they are exaggerated souped up canines (liken this comparison between a 3 cylinder car and a ferrari), and they are souped up for VERY specific reasons. I am honored to share their world, and never lose sight of the fact that their lessons are constant. Sheri Gordon is a phenom artist check her out! Please Note: We are not provincially, or federally funded. 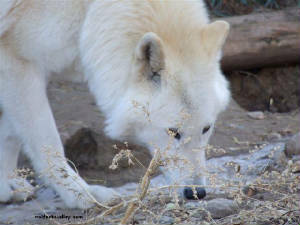 We work to support the outreach work, any programs, and the wolves out of our own pockets, NOT the other way around Through your sponsorship and buying wolf gifts from us, you are not supporting US the human caretakers, any funds ALWAYS 100% go towards future educational programs, & expansion/enrichment for the wolves only, we work jobs like everyone else to support ourselves. 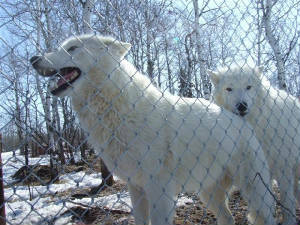 The wolves are not bred for profit, nor do we make a living off their lives. We believe if wild has to be in captivity, that they should have jobs to help their wild brethren via educating with their wild messages. We believe in keeping wild; wild and thus actively participate via partaking ourselves in, and financially supporting other worthy wildlife rehab organizations, & wildlife/habitat conservation organizations.